Our main holiday in 2016, finally after many years of saying “oh we really ought to go…” was: Thailand! And we did it with hand luggage only. Why, you ask? Well, first of all this year in March American Airlines lost my bag when we went to Las Vegas for Andrew’s 40th (only ever so slightly ruining the trip…); I did get it back, but only because me being the persistent me I am and after a wild goose chase through Heathrow’s terminal 3 and 5 after a ten hour flight – but I digress. Also we always liked the idea of really cutting down on luggage and only taking what is absolutely necessary. This also means you have less packing and unpacking to do, less stuff to wash when you come back – and it is so much quicker when you don’t have to wait for your luggage after an 11 hour flight. So in the end we had two rucksacks (6kg and 7kg) plus one cotton bag and the camera bag. Well, we didn’t really have an itinerary. Given 2017 was crazy for both of us at work, there really wasn’t much time (or rather energy) to meticulously plan the trip. So the only two things we had booked were the first three nights near Krabi and the last two nights in Bangkok. 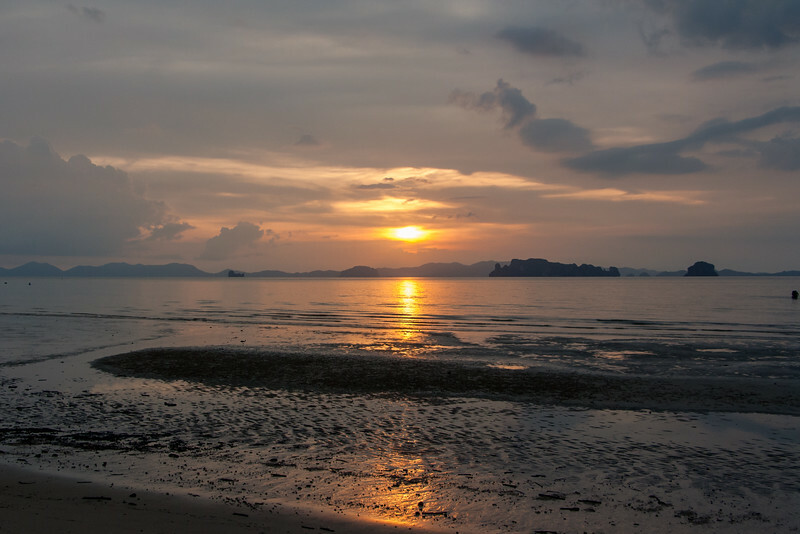 The rest was up for grabs – we basically had to decide whether to go North toward Khao Son National Park and Khao Lak or go South towards Railay Beach, Koh Lanta and the Trang Islands. We decided for the latter – and never looked back. Island hopping in Thailand is the best thing ever! Even with a red-head husband who instantly burns up if not covered in 50LSF from tip to toe. So really: highly-recommended. The first three nights we really treated ourselves to a nice and luxurious resort – which even for Western Standards was expensive: Tubkaak Beach Resort. For us, it was absolutely worth it. Just chilling out and not having to worry about a single thing was just what we needed after this crazy year. … and of course enjoyed the awesome sun-sets, sometimes intermittent with a monsoon storm. After three relaxing, not-doing-very-much-at-all days, we thought: how about getting a night in a “real” place in? So we decided to spend one night in Krabi and the Chan Cha Lay Hostel for about 1/10 of the price – very recommended little hostel. While in Krabi, you should really hike up the 1,237 steps to the Tiger Cave Temple (Wat Tham Suea). It will get you sweating, your heart pumping and your legs screaming (at sometimes 40cms high steps) – but it is absolutely worth it. We just hired a taxi (500baht there and back) from the Main Street in Krabi as it was a Sunday, but during the week there is a Songtaew every 20 or 30mins. Krabi itself is a nice little quirky town with night food markets, a little river promenade and a bit of a backpacker scene. Given a stomach bug knocked us out while in Bangkok making us miss the street food there, we were very happy to have had a great yummy dinner in at Poo Dum Restaurant in Krabi. The next day we went down to the pier for our long tail boat trip to Railay Beach. We bought the tickets (150baht/each) the night before but could have just gone down there in the morning, there was no shortage of seats. The trip is about an hour and goes to Railay East. This is the side where most people stay as the hotels are much cheaper than on the West side and the walk between East and West is 5mins – if you walk V E R Y slowly. So really, it doesn’t matter. We stayed at Sunrise Tropical Resort, a nice enough resort. There are three best things about Railay Beach: kayaking, the lime stones and cocktails right at the beach. Another recommended thing to do if you are not afraid of getting muddy: hike up to the view point over Railay Beach. A little exercise now and again can’t harm with all the yummy food. The favorite islands of all Swedes, we only spent two days there as a stop over before Koh Ngai. What we did? A cooking course at Lanta Thai and relaxing, at Relax Bay. Also, they were just finishing a nice-looking resort there, so maybe that is worthwhile checking out. Otherwise, there was more chilling and reading – and watching some hotel employees play football in low tide, with some brave tourists. The final stop on our trip: crazy, beautiful Bangkok. We just wished we could have enjoyed the street food, instead of suffering from a stomach bug! But even with the bug, we l o v e d the vibe, the sights, the smells and the hustle-and-bustle of it all.